Today we saw the two magnificent heartbeats again. Walking into the exam room, I had to push hard to be strong for my wife. The last time we were here, the doc said "don't get used to twins". 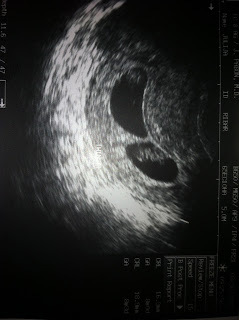 Since day one, God has told me in prayer that we were having twins -- a boy and a girl. On the inside and very guarded, I know we have twins, but still want to see again. My human side I guess. My wife is anxious to say the least... but guess what, there they were. Beating like crazy. One bigger then the other just like the embys we started with.